You will be given a reference e-book to read which has 530 pages And the test will be based on that e-book , you can take final test within 1 year of purchase. Customer Relationship Marketing (CRM) refers to a strategy and approach designed to foster customer interaction, long-term engagement and loyalty. Instead of focusing on acquiring customers, CRM mainly focuses on customer retention. CRM is also proven to be effective when it comes to building stronger relationships with clients and more brand value with the help of marketing activities and strategies. It works in allowing business organizations to build long-term relationships especially with new customers while also streamlining their corporate performance. This approach is effective in incorporating client-specific and commercial strategies with the help of marketing planning, employee training, advertising and relationship building. The strength of CRM is actually its proven ability to collect insights from customers based on their feedbacks with an aim of creating a more enhanced, focused and solid marketing and brand awareness. It is possible for you to build more effective and innovative CRM strategies by using key motivating drivers including a sharpened global customer loyalty focus and web technologies. You can also use CRM in directly evaluating the value of your customers, advancing market share viability at a sounder pace and taking advantage of cross-selling opportunities that prove the pitch of a business depending on customer approval. It should also be noted that you can further improve the effectiveness of CRM if you combine its elements with the strategies used in transaction marketing. 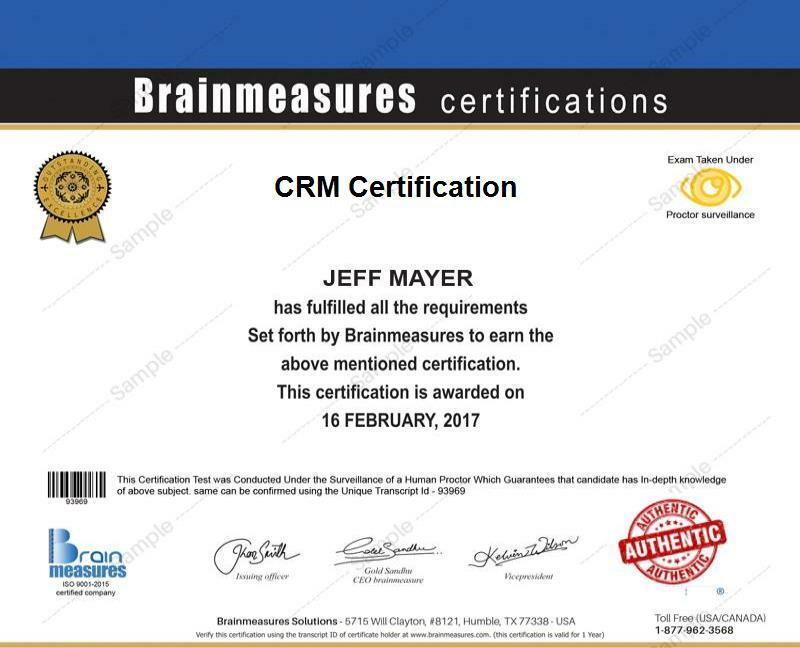 The CRM certification program which you can now access at Brainmeasures is your ticket towards gaining a more complete understanding about how customer relationship marketing (CRM) works and if whether this approach is really effective when it comes to improving the performance of your business. The CRM course available at Brainmeasures is extremely useful in your attempt to improve your knowledge about all the techniques, skills and pitfalls related to CRM. It offers a CRM training which is created in such an extensive way so all the participants of its program will never have a difficult time understanding all the essential concepts associated to the field as well as the techniques that you can use in improving your skills in this field. With the kind of knowledge that the CRM certification course can offer, you will have an easier time updating your skills in applying the approach into your marketing operations while also learning the ins and outs of developing the most effective CRM strategies. Upon receiving your CRM certificate, you have an assurance that you are already well-equipped especially on the many CRM techniques that you can use in fostering stronger relationships with your clients and retaining their loyalty. All individuals and professionals who wish to build a stronger foundation in the field of CRM can enjoy all the benefits of the CRM certification program which is now available at Brainmeasures. This is most suitable for professionals whose responsibilities include sales and marketing, business development and strategy, PR and advertising, brand strategy, branding or brand management, strategic partnerships, loyalty marketing, customer relationship management , customer experience and product development. Your successful completion of your CRM certification course is also a huge help when it comes to finally improving the stability of your finances. You can use your CRM certification to work as a customer retention specialist which allows you to enjoy an average annual salary of $49,000. If you work as a customer relationship marketing associate, then you will get the chance to earn around $67,000 per year. CRM project managers can expect to earn around $120,000 to $135,000 annually and this is already enough to significantly boost your financial stability.